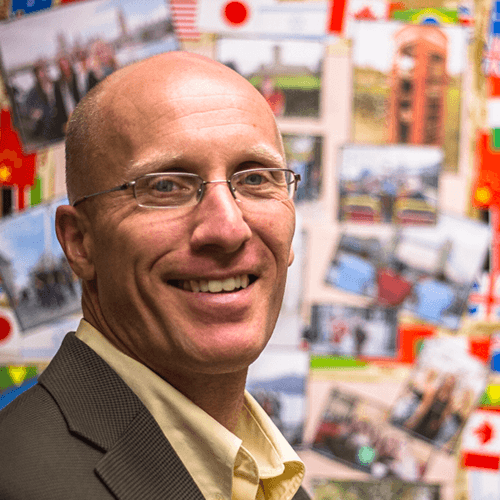 Meet Chris Hirschler, Associate Professor and Department Chair, Health and Physical Education. A professor at Monmouth since 2009, Dr. Hirschler is both engaging and enthusiastic in the way he teaches, and his "classroom" stretches across the globe. From teaching a First Year Seminar that covers the ways humans and non-human animals interact and the impact of those interactions, to escorting students on Study Abroad trips to Guatemala, Italy, and Costa Rica, Dr. Hirschler's influence on his students runs the gamut as he challenges and inspires them both mentally and physically. "The course 'Guatemala Public Health' has been one of the most rewarding experiences of my 15 years in teaching," said Dr. Hirschler who added, "Some of my favorite memories take place on an active volcano in Guatemala with students thrilled to have made it to the top. Another vivid memory is having completed a challenging, sweaty hike of five villages in Cinque Terre along the Italian Riviera with fall Study Abroad students followed by a swim in the sea and a view of what we just accomplished. Other great memories include skiing Mont Tremblant in Canada with the MU Snowriders club and participating in a Zumba class with over 100 smiling students and employees." For the past five years he has taught "Animals: Life, Death, Kindness, and Sin" in which he works closely with a Peer Learning Assistant who helps students as they successfully transition from high school to university. As part of this First Year Seminar, students spend 10 hours at the Monmouth County SPCA as "cat socializers." "We hear from the MCSPCA staff all the time about how much the work we do helps," he said. "Several students have obtained jobs at the MCSPCA. Recently, a former PLA and graduate of this seminar emailed me to say, 'I was surprised to learn that it was one of the reasons Memorial Sloan Kettering Cancer Center was interested in [hiring] me.'" During spring 2016, Dr. Hirschler taught "Adventure Education in Costa Rica," which involved hiking and biking around Arenal Volcano, rappelling down a waterfall, zip-lining, white water rafting, and exploring a rainforest. "Each student experienced what being an adventure professional is all about," he said. When he's not exploring the many wonders of nature, he conducts research on a diversity of issues such as being vegan ("What pushed me over the edge was a deer hunter: Being vegan in North America,", Society and Animals, 2011), sexual assault prevention, study abroad, and sexually transmitted infections. For six years, Dr. Hirschler was a representative for Monmouth University’s Institute for Global Understanding at the United Nations. Dr. Hirschler received a Ph.D. in urban education: learning and development from Cleveland State University, a master's degree in liberal studies: concentration in health from SUNY College at Brockport, and a bachelor's degree in liberal arts: concentration in health from Excelsior College.